Perf-out business cards are a fantastic way to get customers’ and clients’ attention and bring in new business. Our business card die cut postcards measure 4” x 6” and are printed on brilliant white cardstock. These custom die cuts feature a perforated chat bubble shape about the same size as a business card. Treat the card like a comic strip bubble by putting a personal message inside, such as “Hey you! Want 20% off a single purchase this Saturday?” Or, design your promotion so it looks like a business card, coupon, or entry ticket. Use your imagination! Fast turnaround time of 3 business days! 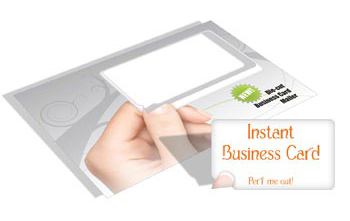 Business card die cut postcards are a flexible marketing tool with many potential uses. Custom die cuts are an effective way to communicate with customers because the fun pop out chat bubble encourages interaction. Our perf-out business cards can be used as gift cards, coupons, business cards, entry tickets, or membership cards. Let’s look at an example that combines some of these different functions into a successful marketing promotion. Many customers value receiving membership cards in the mail. It creates a bond with your business and makes it more likely that customers will seek out your business not just once, but over and over again.